What if a restaurant doesn't serve rice in any form? And they don't give you cutlery? OK, if you notice that there are no knives and forks, you could ask, and they will politely tell you that their food is best enjoyed with hands. Of course, if you insist, you will have your way. Not the best way to eat food, but your way. More often than not, your way may not be the best way like some of us from our party of 5 found out! Get reservations. We were on for a Friday dinner and the place was packed! We were told during entry that there is no rice served and that it is not really kid friendly. We had packed some stuff for the kids, so they were fine. So were we! Small menu on a large menu! Yes. Just a handful of stuff, printed on a super large wooden block. Actually, two menus. One, the usual. Two, the unusual. A 10-11 course meal on one side and I think a 13 course meal on the other, priced at Rs. 3150 and Rs.3500 respectively! Nope! No way. We need to have starved a few days to make that worthwhile! My friends from Germany weren't looking to roll all the way to Germany. They simply wanted a great Indian dinner! So we asked the waiters to serve us one veg and one non veg starter! Some Paneer in triangles arrived! One bite each and the table was in silence. You could clearly hear the kids! The adults were quiet. Then slowly, the praise for the paneer started pouring out. Soft. Juicy. Stuffed with potatoes and cooked in the tandoor. Oh, everything here is cooked only in the tandoor. So, no rice, biriyani or anything that cannot be cooked in the tandoor, on the menu! This was followed by a succulent, flavourful, definitely super fattening, Murgh Malai Tikka. The tikka was fabulous to say the least and so so so soft. Clearly, no knives were needed and the one person who tried eating with the fork, put it down quietly and started using his hands. Yours truly! While pricy, the portions were hearty. There were 8 pieces of paneer and 6 pieces of chicken and they were large hearty pieces. We wanted to try the Naan Bukhara, called the family naan and we were warned that it was for about eight people and will be too much for the five of us. We ignored the warning. 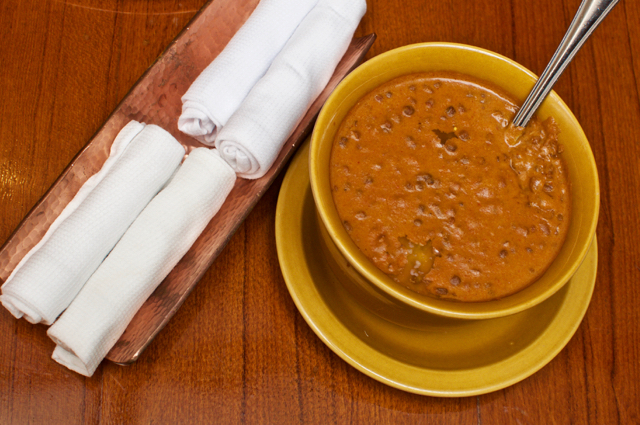 We got the Dhal Bukhara for company and went with the waiter's choice of semi-gravy chicken. The Naan was huge. For Rs. 1500, it certainly could feed about 8 people. We had to pack almost half of it home, but be warned. 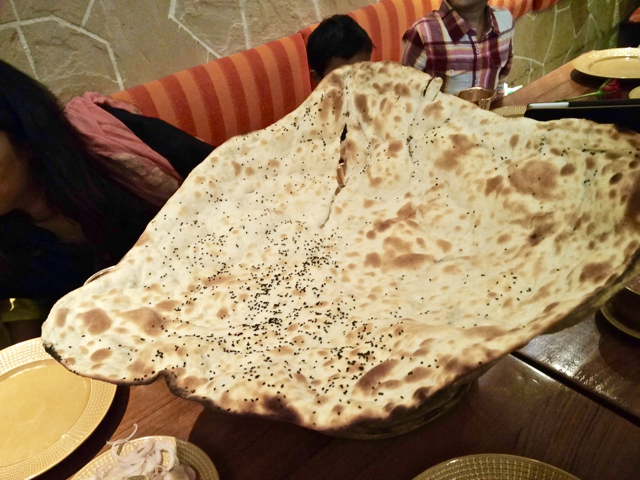 Even if you have a big appetite, order the naan bukhara ONLY if there are about 8 people because, because of the way it is cooked, it dries out super fast and then becomes leathery after about 10 minutes, if not less. So it goes from juicy to stretchy very quickly, so all of us who took the third helping after a few minutes, found it hard to tear. At home, same problem. 2 minutes out of the microwave and you had to reheat it to make it soft. But during those first few minutes, this naan with this dhal is heaven! The semi gravy chicken that was served was licked off the plate in no time. We had ordered a wonderful romali roti (for the kids) which was super soft all the way through! No space for dessert, so we split one Kulfi, just to end on a sweet note! This is a real treat and the cuisine is very specific which is great! If you've been to Bukhara, please refrain from comparing! We know and we've heard that the original is better, but in Chennai, this is it! Our bill was Rs. 6750 after a 20% discount! And they give you a tiny copper cup as a souvenir! So cool! 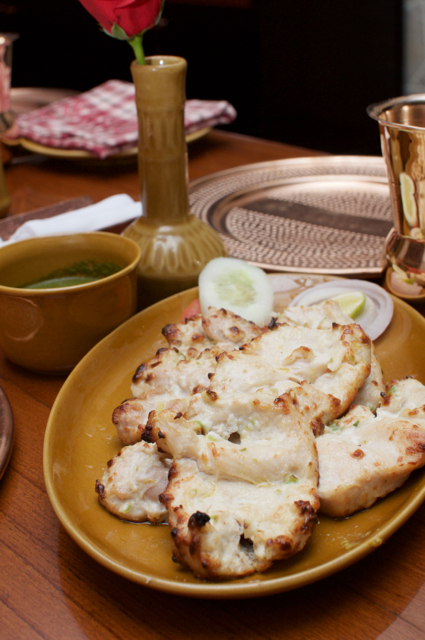 Peshawri is open for dinner and is at the lobby level at ITC Grand Chola!